Using Large Tires To Improve Strength! Tire training can add a new dimension to your strength and conditioning program. Learn why it isn't just for strongman competitors! Tire training can add a new dimension to your strength and conditioning program regardless of what sports you play or your level of athletic ability. When people hear me speak about adding tire training into a strength program they often have the mistaken impression that tires are only used by athletes who compete in strongman contest. The strength and aerobic benefits of tire training can enhance your performance in all sports from gymnastics to football. Tire training is one of the best total body strength and conditioning workouts that a person can do. You use your total body when you flip the tire, and by varying the distance you flip the tire and time you flip the tire you can get a great aerobic workout. Where Do You Get A Large Tire? The best place to go to find a large tire is at a tire dealership that deals in farm tires or a tire dealership that deals in earth moving equipment tires. Normally these places will be more than happy to give you the used tires. Even in cities there is usually a dealership that works with earth moving equipment. I found my large 800-pound tire discarded as trash in a field about an hour from my home. All I had to do was borrow a friend's pickup truck and have my father-in-law help me roll it up a ramp into the truck bed. Finding a tire in the weight you want may take a few phone calls and maybe a little travel, but it will be worth it. If you can get the tire's make and model number, the tire store or manufacture can give you the weight of the tire new. You can deduct weight based on the ware of the tire and get a pretty good estimate of your tire's weight. What Weight Of Tire Should I Get? Al Johnson is this year's NCAA Strength coach of the year. Coach Johnson uses a 350-pound tire for his female athletes and a 450-pound tire for his male athletes. These are good weights to use in strength and conditioning program for athletes involved in a variety of sports like football, basketball and volleyball. If you are involved in strength contest get a starting tire of 650 pounds or more because most of the tires used are in the 700-800 pound range. For those who just want the tire for fitness and a good total body work out you may want to get a tire in the 200-300 pound range. How Do You Flip The Tire? When you flip the tire it is best to start with the tire flat on the ground. Place your fingers and hands as far under the tire as you can in this position and keep your hands about shoulder width apart. Squat down and then while pulling the tire up with your arms and back explode out of the bottom position. As the tire comes up you should have enough momentum that you can change your hands from a pulling to a pushing position and push the tire all the way over. Immediately after the tire is pushed over and flat start the process again. In the beginning you may have to use your knee to pop the tire up high enough so that you can change hand positions to a pushing motion. Try to get away from using your knee as soon as possible to avoid possible leg injury when you have one leg planted on the ground and one in the air. You can flip the tire on any type of surface from concrete to grass to sand. 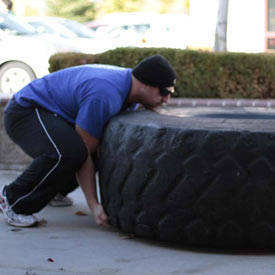 I would incorporate tire training into your work out one or two days a week. You can work on strength and speed one work, and you can focus on conditioning and strength the next workout. Flip the tire over a 70-meter course for time. Have someone time you on each set and keep track of your times. As you progress you should be able to get quicker as you continue to train. 3-4 sets. Flip the tire up and down the course as many times as you can in a 90-second or 2-minute period of time. Keep track of the number of flips you achieve each set. As your endurance increases you should be able to flip the tire more times in the time limit. If the 2 minutes gets to be too easy increase the time that you flip the tire in 30-second increments. 3-4 sets. Make the tire flip part of a medley of events. Pull the sled for 70 meters and then flip the tire back for 70 meters. Another variation would be to pick up and carry sand bags 70 meters and load the sandbags into the sled. Pull the sled back 70 meters and then flip the tire back 70 meters. Start with 2 sandbags and work up to 3-5. With these programs feel free to increase or decrease the distance of the events or the weights. The main thing is to get out and train using these alternative methods to help take you to the next level of athletic achievement. Learn about bodybuilding, powerlifting and strongman competitions from Chad Coy and Bryan Neese, two of the most well known experts in the field!